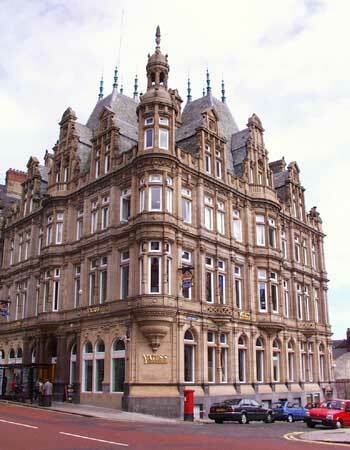 Yates Wine Lodge, Grainer Street, Newcastle. Location: Grainger Street. Status: Listed Grade II. Occupying a prominent open corner next to St. John's Church and on rising ground, the architect developed the site with a metal framed structure clad in an authentic French Chateau fashion. Its best feature is the roof a mixture of turrets, pediments and pavilions with rich green Westmorland slates in diminishing courses up each steep roof slope. The ground floor is arcaded with curved headed windows with balconies are placed in the centre of each face, and an elaborate rounded corner bay rises from a finely curved bracket up the building to a drum, open dome and finial. Fortunately, after a very damaging period of vacancy, the property has been renovated and re-opened as Yates Wine Lodge.